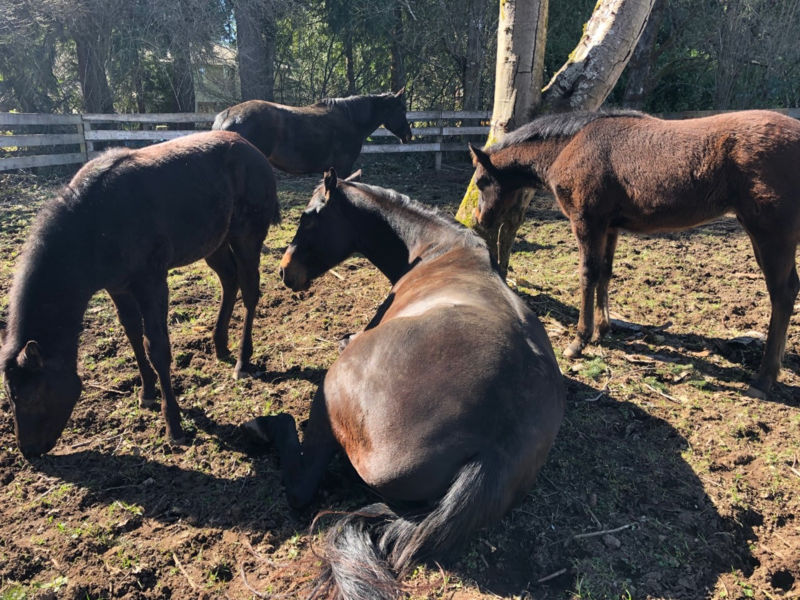 Angel and her five herdmates were surrendered to SAFE by their owner, who was no longer physically or financially able to properly care for them. 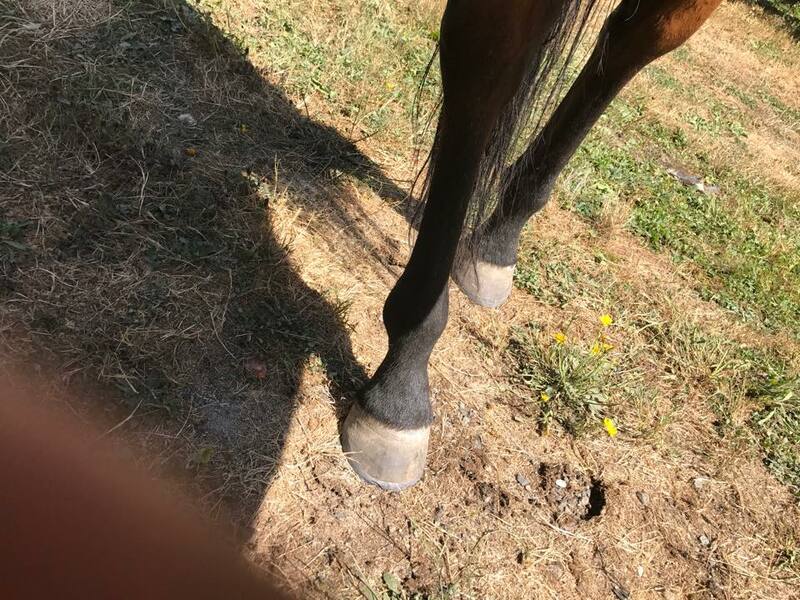 The horses were in decent weight but had not had farrier or dental care in some time. 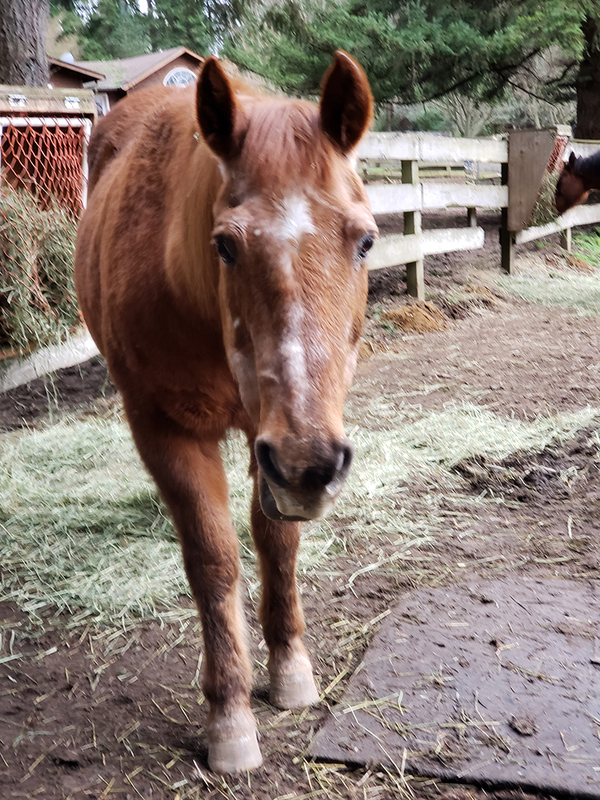 Because of Angel’s age, we took her in as a Hospice case, with the intention of providing her with a couple months of good care before letting her pass peacefully. However, she is quite the spirited old gal, and remarkably healthy and sound. Perhaps there is another chapter to her story yet to be written, and a new life as someone’s beloved pet and companion. Angel seems very unaccustomed to being handled, and has a lot of fear. She was quite difficult to catch when first we met, and it took over 2 hours to catch her in the field the first time we tried. Now it takes about 5 minutes to convince her to let herself be caught, which is a definite improvement. 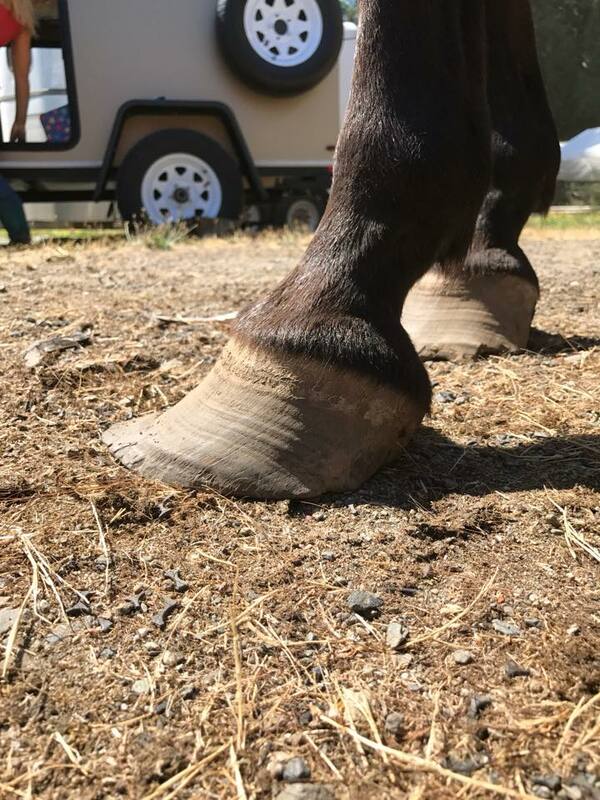 There is some sort of abnormality with her left hind foot, but she seems to get around on it just fine. 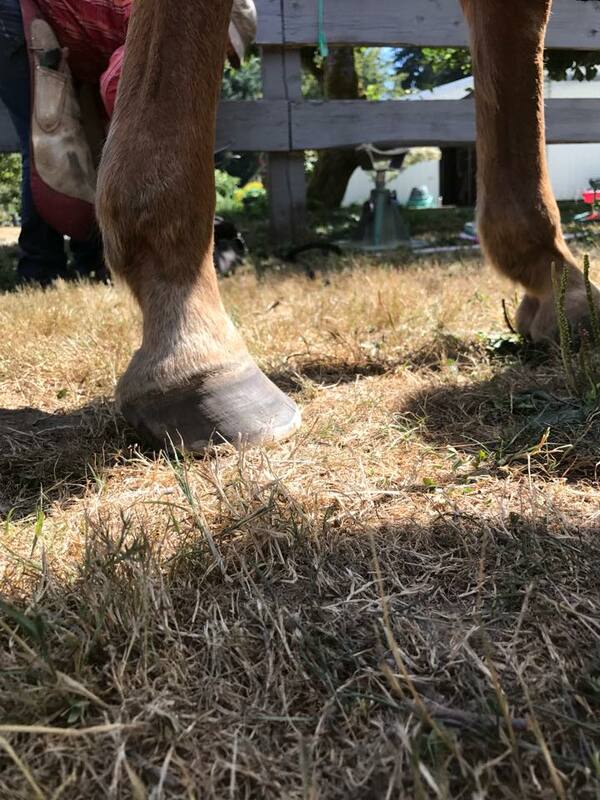 We were only able to trim her front hooves when our farrier was out, so Angel will need continued practice with having her feet handled so we can get her hinds taken care of. All SAFE horses are adopted with a no‐breeding clause, no exceptions. 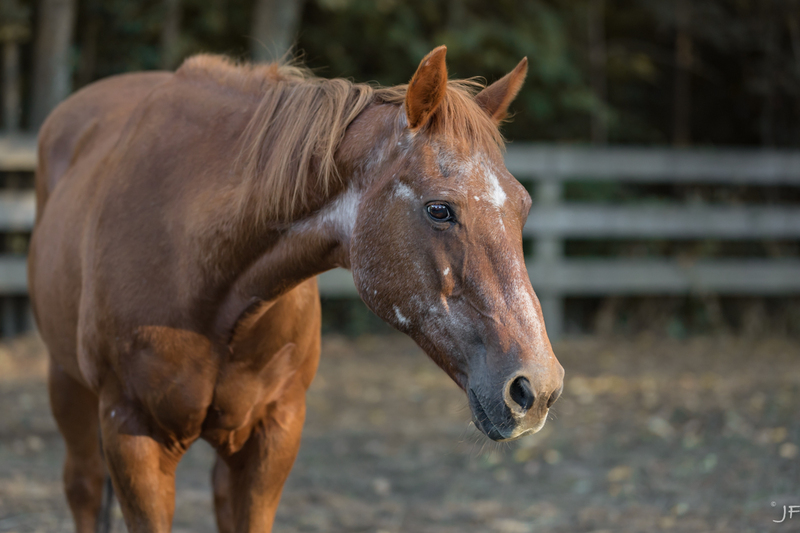 If we determine that she should be made available for adoption, Angel will be offered as a companion horse only. Angel takes her time getting to know new people. She has come a long way with basic groundwork; a consistent routine with “her” person will really make her shine. 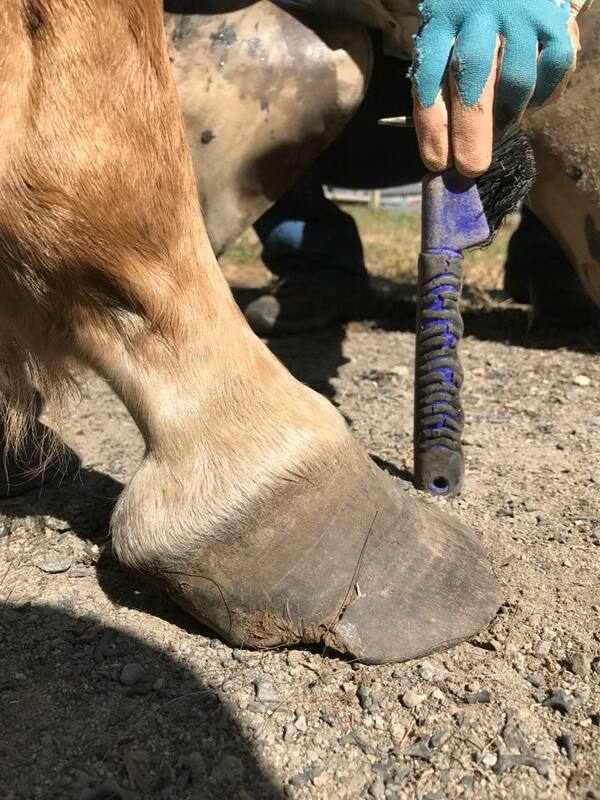 Angel is still a work in progress when it comes to having her hooves handled but every time with our farrier things get easier. 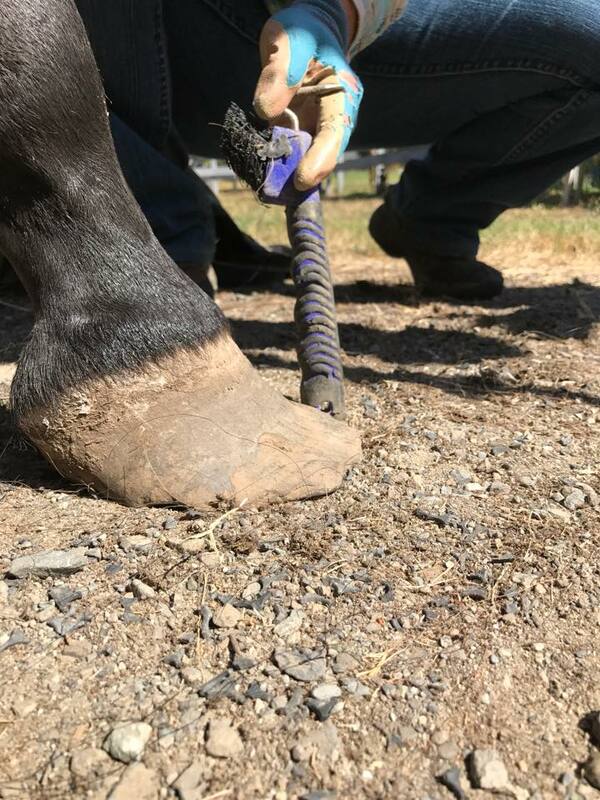 We are now able to trim all 4 hooves–BIG progress for a mare that was unhandled until SAFE picked her up! We monitor her closely for comfort, but nothing at this time seems to be slowing this mare down. 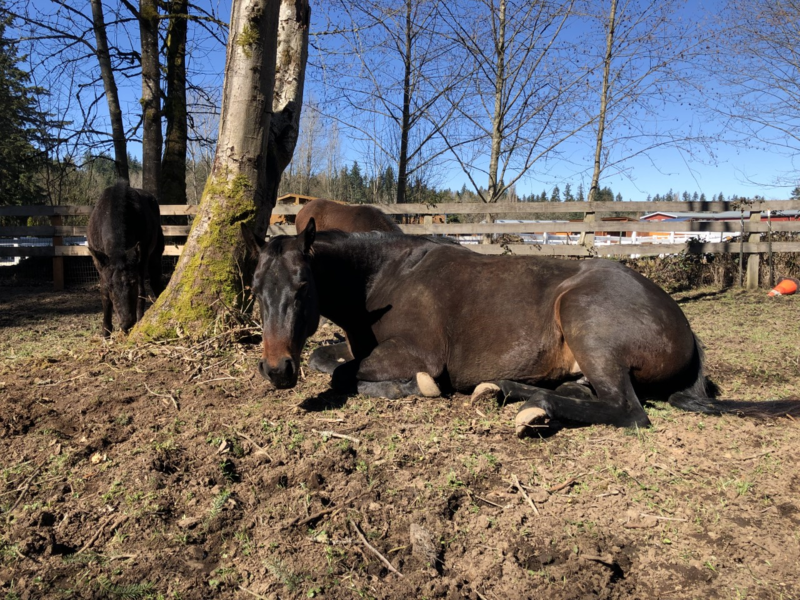 We would prefer that Angel be adopted with her best friend Renee, a 20‐year‐old mare, also available for adoption as a companion or riding horse. 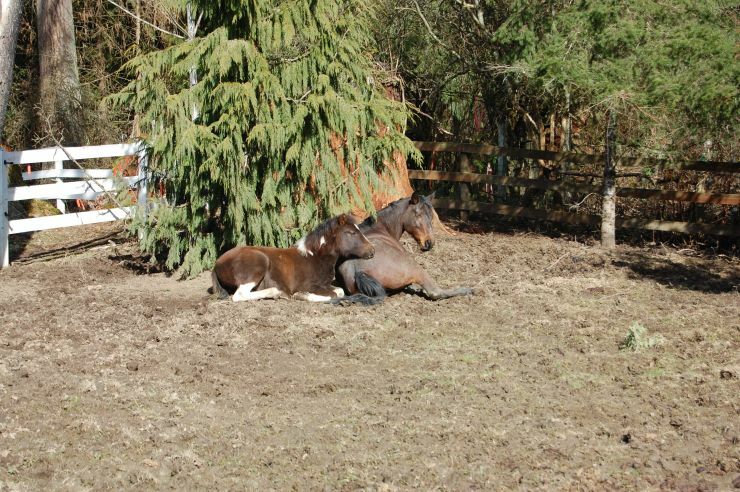 They were surrendered together and are life‐long pals and would love to share a pasture with some new friends. My name is Mona Sterling and I’m a volunteer at SAFE. 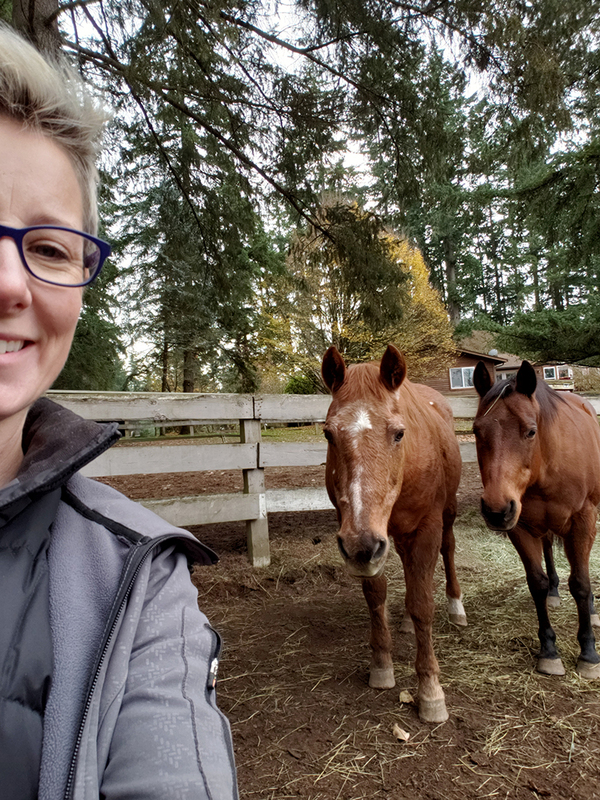 One of the things I do is work with SAFE’s companion horses. Some of these horses are forever companion horses due to age or illness and others will move into being riding horses. 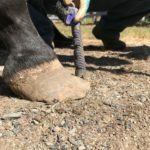 My work is not about perfecting groundwork (though I do insist on good manners when I am grooming or leading them) but is about instilling confidence and trust in the horses, something that rescue horses are often in short supply of. I do this using a method I learned from a woman named Elsa Sinclair. 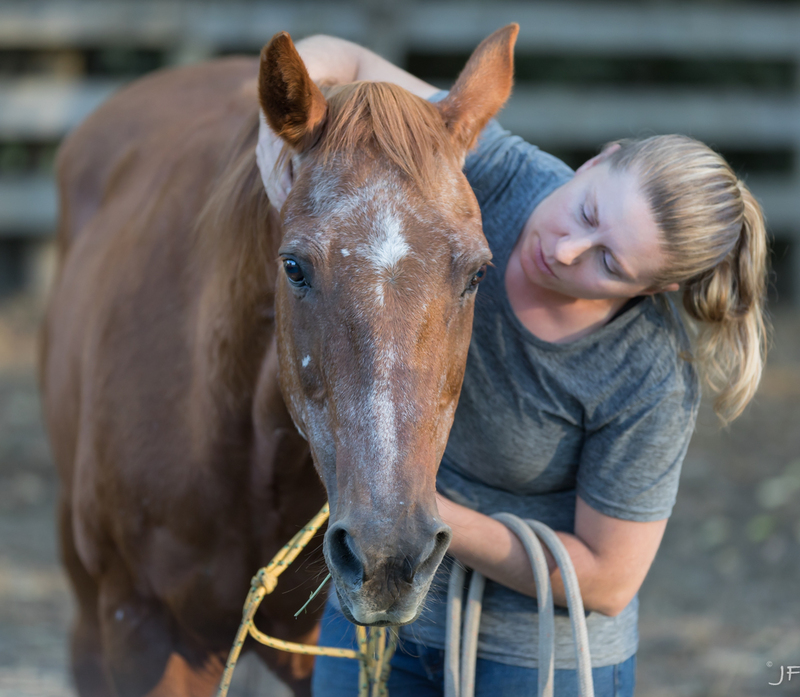 Elsa teaches something called Freedom Based Training, which at its core is about giving horses choice, building emotional stability, and developing strong relationships. I am very much still a student in this work, but it utilizes passive leadership as a means to show the horse you are listening. So while it often looks like I’m just hanging out in the pastures with horses doing nothing, I’m actually watching the environment for them and reacting to their movements. 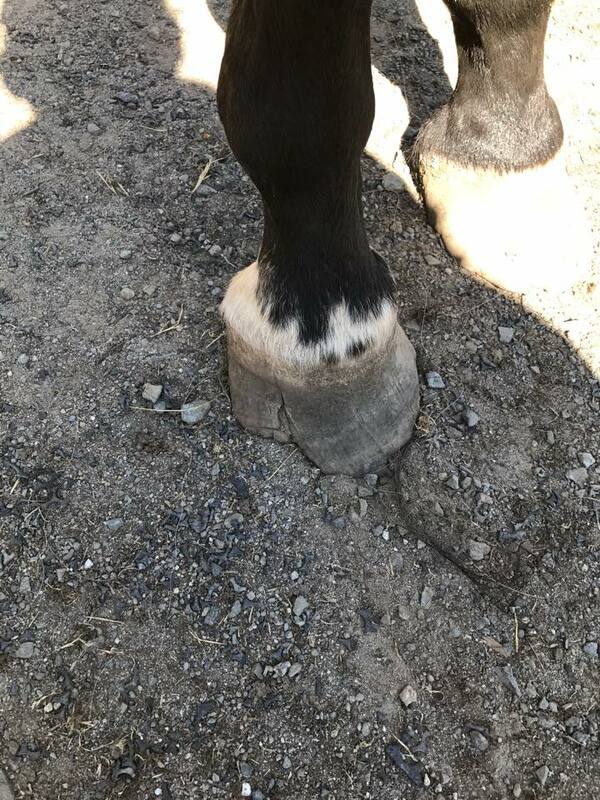 I’m trying to show them that I am really paying attention to their subtleties, which horses are masters of. I’m less of a horse whisperer and more of a horse listener. 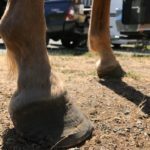 You can learn more about Elsa’s work and how she trained a wild mustang without using any tools or treats at www.tamingwild.com. Angel is making huge improvements, though to the naked eye, it doesn’t look like much. 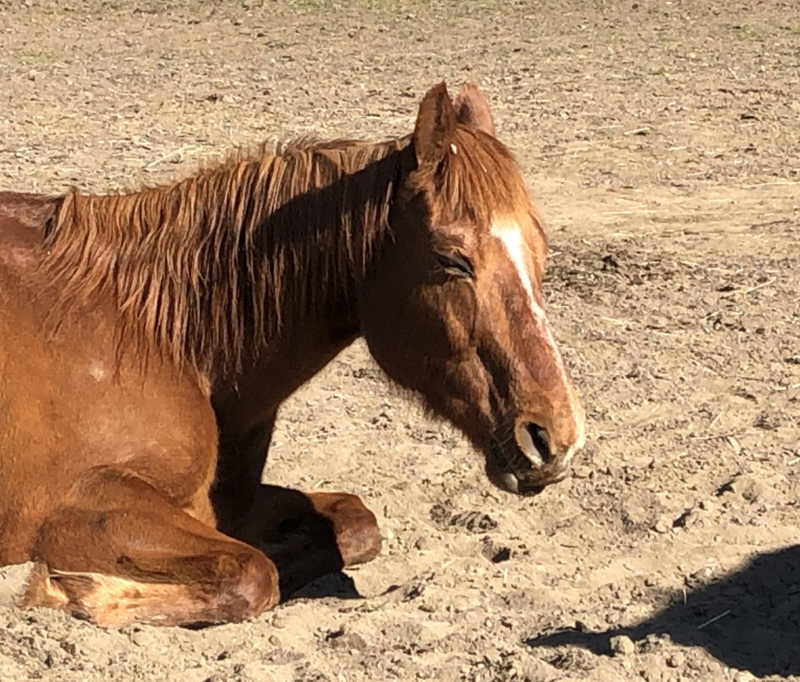 She has gone from being very tense as soon as I entered the pasture, to actually taking a nap while I stand watching the environment. I have gone very slowly with Angel, allowing her to set the distance she’s comfortable with. She will allow me to stand on all sides, including directly behind her. Though she does check over shoulder sometimes when I’m in her blind spot, she does not choose to leave and usually goes back to eating. My hope for Angel is that by doing this very slow work, where she always has a choice to leave, that she will start to develop good feelings when humans are around. This should transfer over to any work her other humans have to do with her, such as haltering and grooming. It often looks like I’m doing nothing or just checking my phone a lot when I’m out with Angel, but she really appreciates it when my energy is not laser focused on her. I’m always watching her out of the corner of my eye so that I can gauge her reactions and comfort level. Though I have not gotten close enough to touch her, Angel is seeing that I’m willing to hang out with her on her agenda. The legendary horse trainer, Tom Dorrance said “First you go with the horse. Then the horse goes with you. Then you go together.” I’m giving Angel all the time she needs and will continue to go with her until she’s ready to go with me. Angel and I had a breakthrough today!! 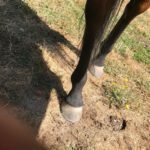 Sometimes, when I’m doing Freedom Based Training and I’m just standing around in the pasture taking a step here and a step there, it feels like I will never see any progress. And progress can be so slow, that it’s hardly noticeable. But today, Angel renewed my passion for this work by choosing to leave her best friend and her food and take five steps towards me. She stopped about an arm’s length away and just watched and waited. We stood together (I had to physically restrain myself from wanting to reach out!!) for a few minutes, just breathing together and then I left. It’s always best to leave on the best note and I can’t think of a better one, than her making the choice to come seek me out. I have not coerced her, pressured her or bribed her. I have simply spent hours showing her that I am listening to her and watching the environment so that she doesn’t have to. Moments like I had with Angel today make all the cold days standing in the mud worth it a thousand times over. Angel has been a fun and unique challenge for me so far. I’ve only recently started working with her and she has already taught me so much! 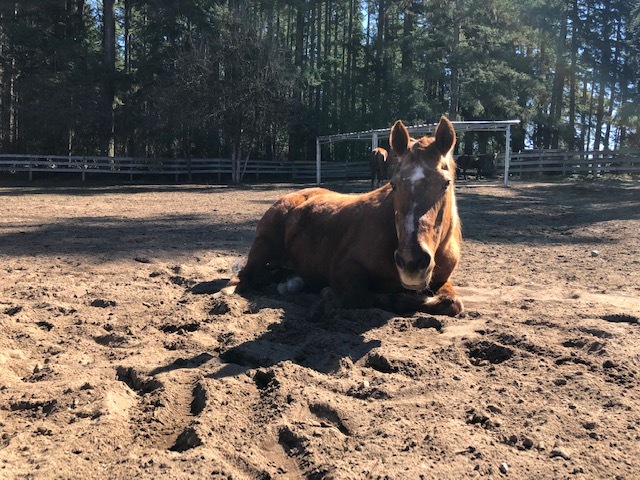 I’ve never spent time with a horse who is so not trusting of people and it’s been amazing to notice the little changes in the way she responds to me. Angel is so smart, it’s easy for her to figure out the best way to kind of escape the pressure and find the release. Today I was able to get her to calmly transition back and forth between walk and trot at liberty based off of my feel and she was licking and chewing all the time. The “hooking on” exercise is so easy for her as well. She is so sensitive, it has helped me to realize how small my movements can be to get a reaction. Angel is still not great about changing eyes and has an especially difficult time with her right eye. We will keep working on this, slowly but surely! 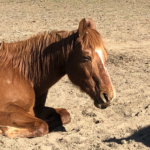 Angel came to us extremely shy and mistrusting of humans, and also undernourished and in need of farrier work. My first time catching her at pasture with her herd was maybe 30 min of advance and retreat games that she finally acquiesced to. Due to her weight, we have been feeding her a mash at lunch in addition to her morning and evening feeds. To feed her, we must catch her and lead her outside of her pasture to keep her herd‐mates from sampling the delicious grain. This little ritual of catching for grain has helped her immensely. In addition to associating being caught with being fed, I have been very, very slowly and gently working on handling her and accustoming her to human touch. 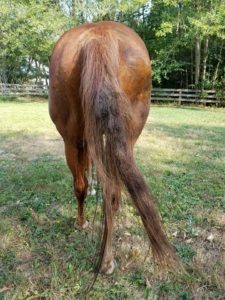 She is still very touchy around her hindquarters, especially from the stifle downward. However, after a couple months of this ritual, I can now touch her anywhere from shoulder to stifle without too much trouble. We are still taking this slow, rebuilding trust, but it is showing positive results in other areas. She is now being easier to catch and handle by other volunteers, as I now use any opportunity for other volunteers to catch her to accustom her to being handled by other people. She is coming along in great leaps and strides, but still has a long way to go. 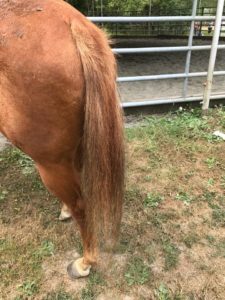 Compared to some horses who need more structure and support, Angel needs quiet love and someone with the patience to keep at her trouble spots for as long as it takes for her to have her process with it. 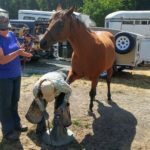 We’ve been able to get a blanket on her to protect her from the rain in turnout and she even let Lori, our Barn Manager, fix it when it flipped up over her hind end. 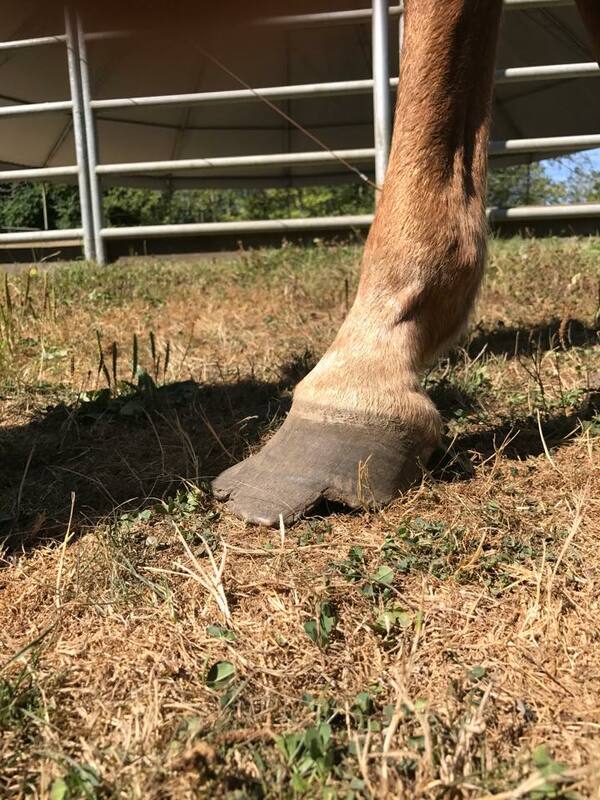 We still are not using back straps so she doesn’t get worried about them touching her hind legs but this is something we can work towards. She also got a GLOWING report from our farrier Daphne. 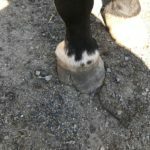 She was able to pick up Angel’s hind legs with absolutely no kicking out! This is a huge step in the right direction. We still have not attempted to trim her hinds but they are not in bad shape so if it takes her a little more time getting comfortable with them being handled that is OK.
From the day we met her, this mare has proven to us that she is a fighter who has taken care of herself for a long time. We were told that no one had haltered her in the 15 years she had been on the property. It took us about two and a half hours to halter her for transport but once we caught her, she was very easy to load and manage. When we got home she actually seemed calm, not sweaty or nervous from the trailer ride. Haltering her in the field has gotten a lot easier and takes less time. 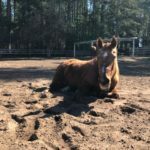 For the first weeks she would only allow Terry to approach her but this week she is opening up and Lori our barn manager has been able to halter her as well. It helps that every time we catch her we make sure she has a bucket of senior feed to enjoy. She is slowly learning that we are here to help and we are hopeful we can give her a happy retirement where all her needs are met. Her medical evaluation has been positive for the most part. Her teeth are old and worn down but no major complications. She will need to maintained on some amount of senior feed to help her get the nutrition she needs. 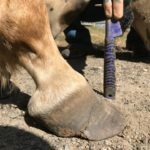 Her front hoof xrays looked good and while she would not let us touch her hind end just yet, we have been able to trim her front hooves and are working on her gaining our trust with the hinds. She has some issues with her left hind. At this point it seems mostly mechanical but we are monitoring for pain and comfort levels. This mare has already come a long way in trusting us. Each day we build a better relationship with her and while there may be small setbacks along the way, there are wonderful days ahead. 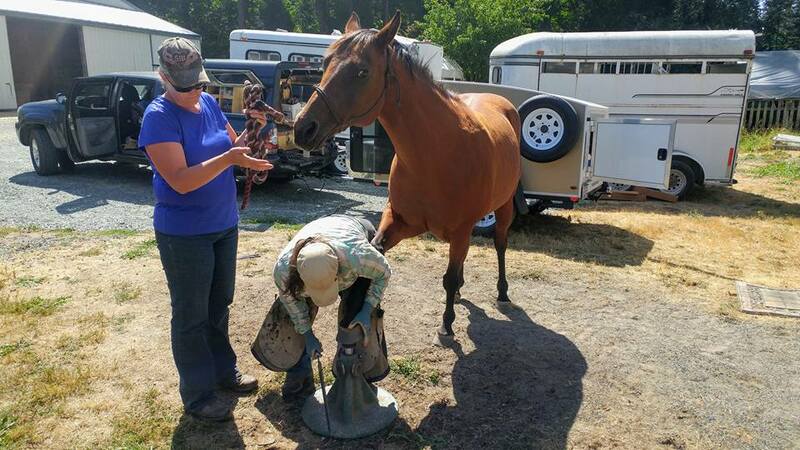 Farrier Daphne Jones came out today to work on the badly neglected hooves of our new horses. 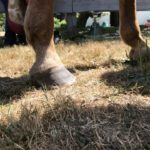 She was able to trim all of them, except for Angel, who was very reluctant to have her hind feet handled. Daphne worked with her to get her more accustomed to having her hinds picked up, and will be back out very soon to attempt another trim. 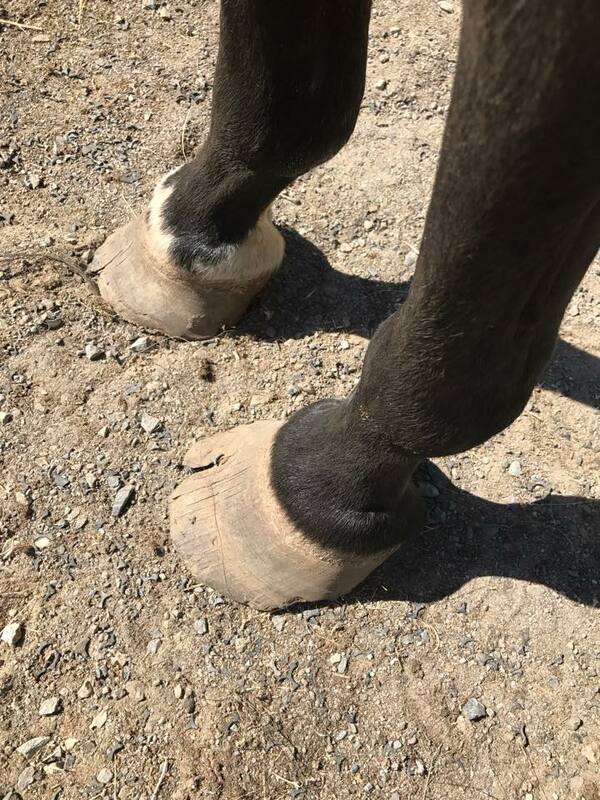 The good news is that as bad as their feet looked when we picked them up, Daphne was able to make everyone’s hooves look relatively normal again. 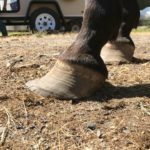 With proper hoof care, these horses should remain sound. 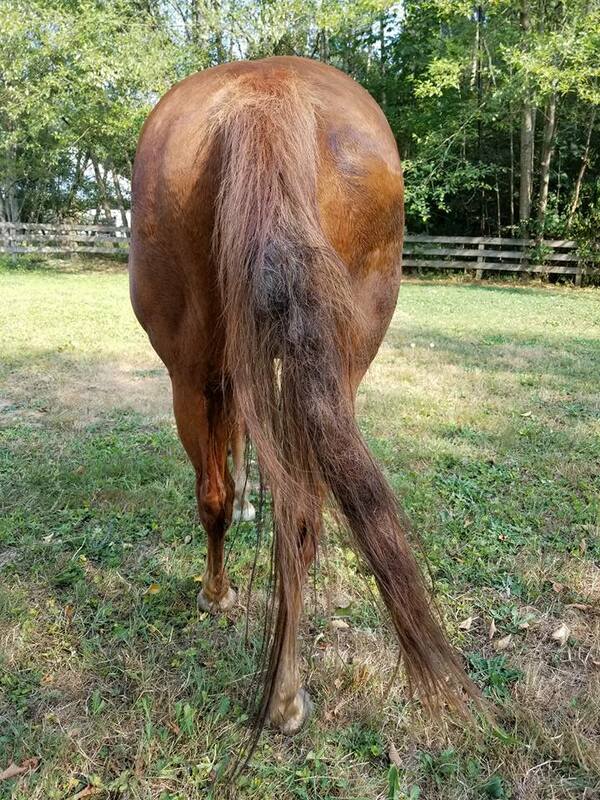 Not how a tail should look!! Poor Nashville and Angel had tails that resembled baseball bats!! 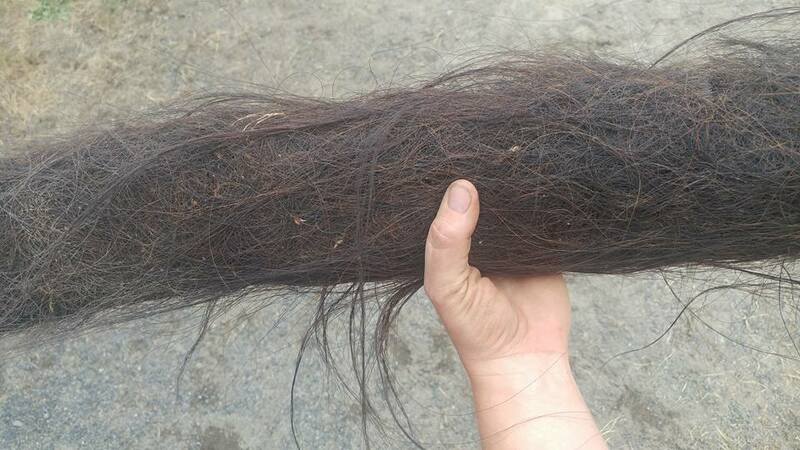 With a lot of patience (and a fair amount of Tail & Mane Detangler) we were able to save a lot of Nashville’s tail. The matted clump that was Angel’s tail was cut out. 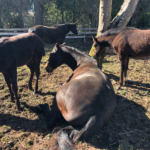 SAFE has recently taken in 6 new horses. They were surrendered to us by their owner, who was no longer able to care for them, due to physical and financial set backs. 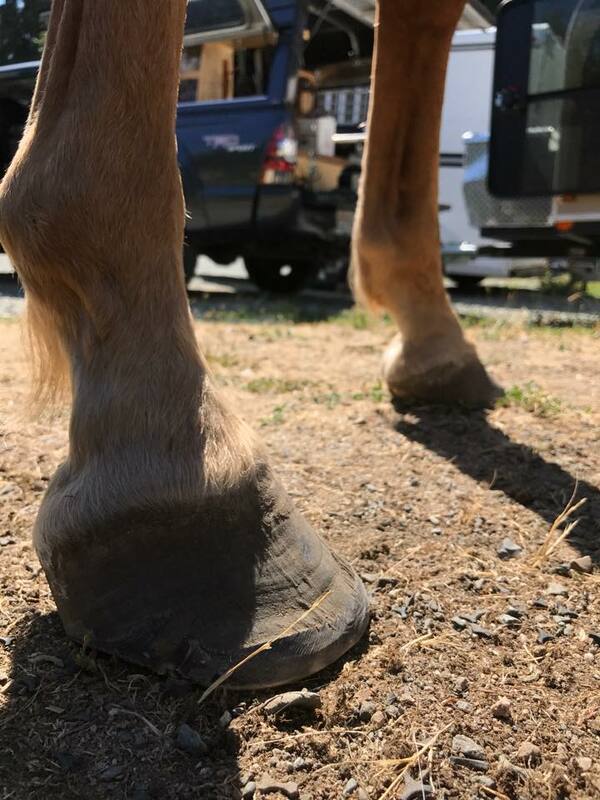 The horses were all in decent weight, but had not received farrier or dental care in many years. 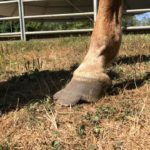 Most had extremely overgrown feet, causing lameness and discomfort. Two other horses belonging to the same owner were humanely euthanized due to pain and old age. 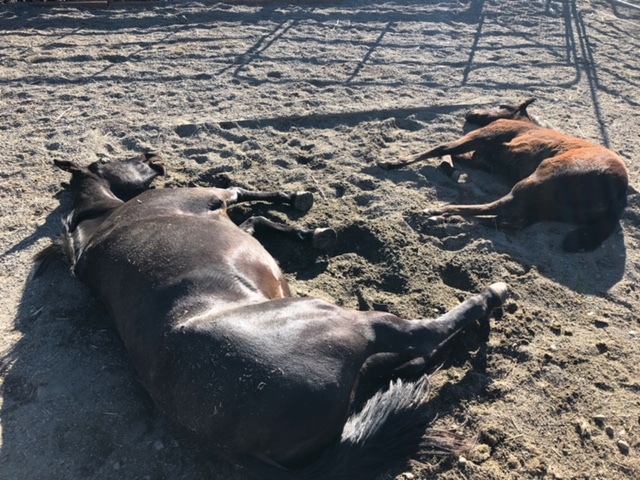 Our decision to take these horses was based on several factors. 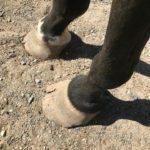 We felt that without our intervention, the horses would continue to suffer, and were likely to become thin once winter set in. 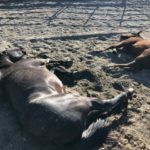 We also have reason to believe that there was a genuine risk that one or all of the mares would be impregnated, either accidentally or intentionally. 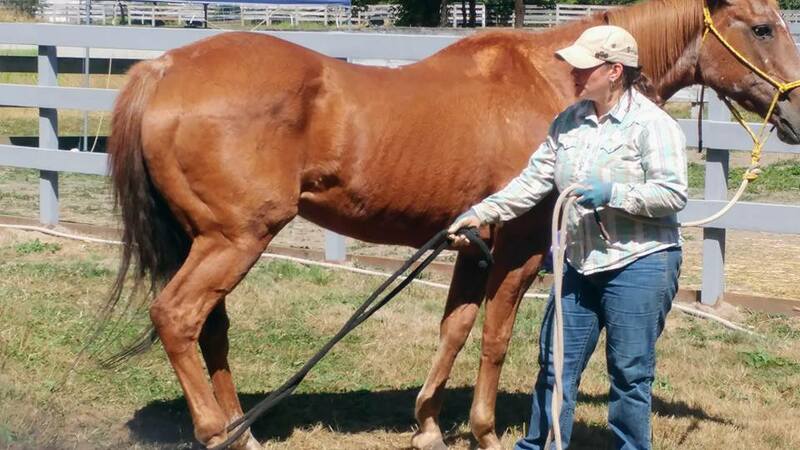 The six horses now reside at Safe Harbor in Redmond. Valor is stalled at night and spends his days in a private paddock. The other five are living together in a small pasture where they can be safely quarantined from the rest of the herd. Click here to sponsor Angel!